It’s a great question since drone mapping is already becoming a go to “tool” for many types of companies from surveying, to engineering, to general contracting, to construction. In stark contrast to traditional, outdated methods, drones are expediting workflows and saving significant time and money as they are increasingly used to map large areas. It’s a niche any serious drone pilot should consider. Therefore, we highly recommend that anyone interested in drone mapping learn the systems involved in data acquisition and the nuances of photogrammetry processing applications. While it may seem like a vast amount of information one needs to absorb (and it is, to be fair), the best informed pilots will be able to create deliverables in situations where most cloud-based applications fail. An educated drone pilot and “mapper” can provide much better data than someone who is just counting on a mobile all-in-one application to provide them with accurate results! To that end, we have pooled together the collective knowledge and wisdom of our mapping pilots to provide you with the most comprehensive, experience-based information available today. 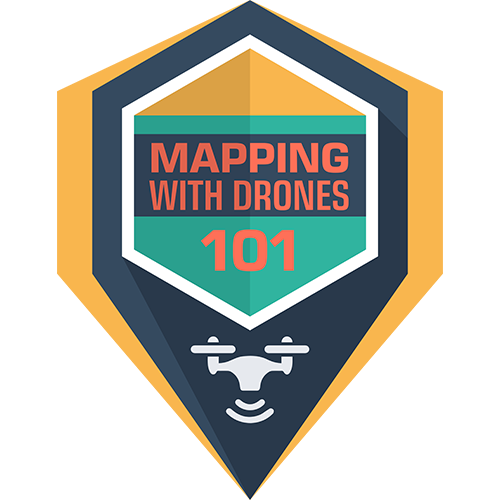 If you follow our “map” to drone mapping, you’ll have a clear understanding of drone mapping, software used to process mapping data, tips and tricks from actual pilots doing this for a living, and a path forward to add mapping to your list of drone piloting skills. So are you ready? Let’s power up and get going! It was not all that long ago that the only way to get an orthomosaic of a large property with high accuracy was to fly in a cessna or helicopter! With the rapid advancement in drone technology, as well as the decreased cost of high accuracy RTK GPS, the cost and time to obtain these same orthomosaics has, likewise, decreased significantly. Drone mapping is powerful because we’ve taken the age old science of photogrammetry (1867) and merged it with a fast, seamless, and autonomous process to acquire data and gather measurements. Further, due to the remarkable speed of data acquisition and the powerful resources of high end computers, we can now create survey grade (ASPRS Standard) data in a fraction of the time. As you can see from those examples, drone mapping provides a truly unprecedented level of detail and data for companies. This helps them make better, more informed decisions, which leads to increased profitability, which can then lead to increased opportunities, and the cycle goes from there. Drone mapping is powerful! How many problems can drone data help solve? The possibilities are almost limitless. To give some sense of form to that limitless space, here’s a great article to check out by Propeller Aerobotics. It will give you some ideas of what can be measured with drones and volumetric tools. The construction industry benefits from operational efficiencies provided by aerial data via drone mapping. With the ability to gather linear and volumetric measurements from the sky, construction engineers and general contractors can remotely audit the progress and process of a project without ever stepping foot on the site. This includes things like remotely analyzing stockpiles of raw materials, general 3D point clouds for permanent records of installations, and auditing cut and fill calculations, even ensuring that the elevations gathered are accurate. Learn how one stockpile company saved six-figures in just six months. Thanks to traditional photogrammetry methods, surveyors can rapidly collect data in one hour that not too long ago took a half day or more. 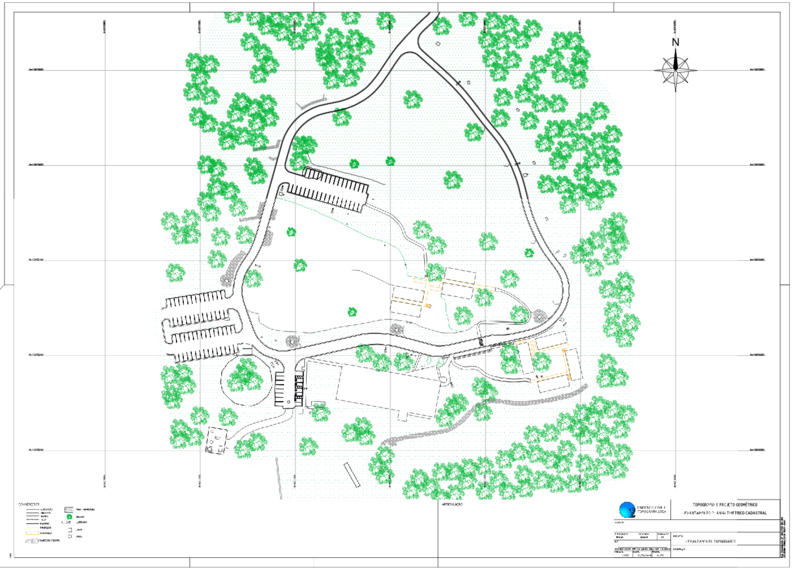 We’re noticing most surveyors are creating orthomosaics, topographical maps, and contour lines. With an existing understanding of geospatial equipment such as RTK Rovers and Total Stations, surveyors have been implementing drone technology into existing workflows to drastically speed up delivery. In the Drone U community, we have found that surveyors are currently finding about 33% of all traditional property surveys to be incorrect due to human error or navigational difficulties. In comparison, how accurate are UAV surveying methods? Check out this helpful “white paper” by Pix4D. *In order to determine boundaries or interpret drone maps, you must be a licensed surveyor. Drone pilots can gather imagery and stitch images together to create maps, but most states determine how mapping deliverables are licensed. While drone maps are not used in traditional real estate, they are popping up in a myriad of ways for luxury and high end real estate. Even major resort chains are using drone mapping to create a 3D model of the resort’s exterior so customers can do a virtual walk around the property and/or building(s). Large landowners and ranchers are using orthomosaics from drone mapping to get an accurate estimate of boundaries, also allowing the client to remotely walk-around or fly through a large property online like this one we did for a client. Additional property details can be ascertained from drone mapping, as highly detailed aerial maps allow for property managers to make wiser, educated decisions. This includes things like checking the slope of a property to determine a realistic flood plain, or analysing watershed of the property to see how weather events will negatively affect the property. Ranchers love drone and NDVI maps because they can showcase overall plant health and help determine the best places for soil analysis. With water becoming more and more valuable, ranchers can now get a better sense of distribution patterns for rain water and runoff throughout the property to better determine how the overall area is being affected in localized regions. Public safety officers and investigators alike are using drones to create highly accurate 3D point clouds and orthomosaics to better understand crash scenes. 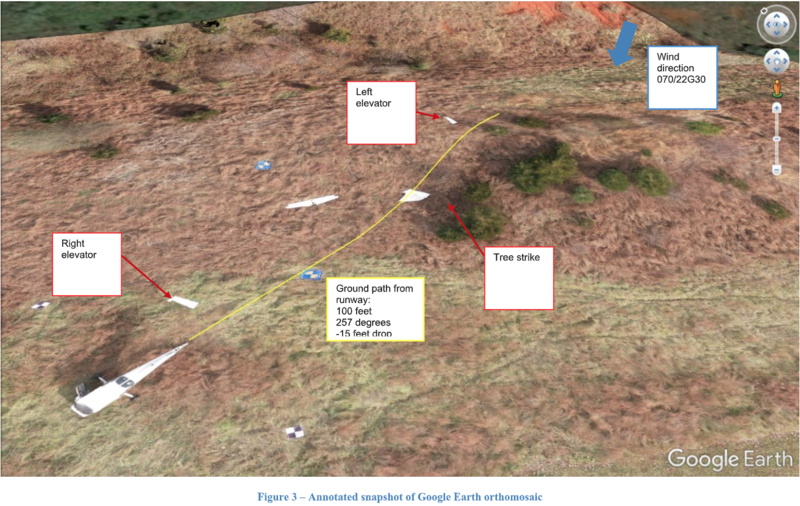 With aerial data collection, paired with RTK based GPS, investigators can more accurately disseminate what occurred prior to a crash by gathering linear measurements and aerial perspectives. 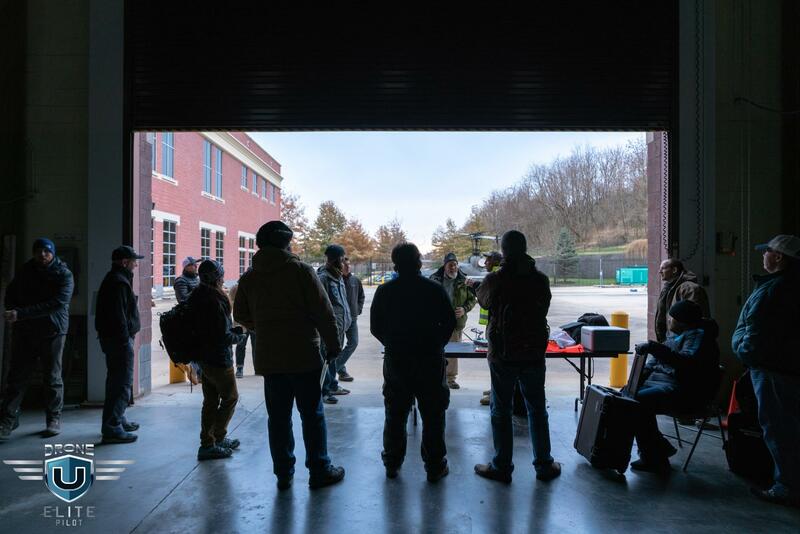 Drone U has the unique opportunity to train accident reconstruction at the NTSB Training Academy in Northern Virginia. This has enabled us to prepare pilots and investigators how to quickly gather data and reconstruct the scene after the area has been cleared. This drastic increase in the efficiency of mapping what are sometimes fatal accidents can have a positive economic impact on the local economy, not to mention the many benefits for the police and families affected. When traffic is inhibited by a crash or accident, delays have a ripple effect causing businesses and agencies potential harm over time. With the data now being collected quickly with drones, better answers are acquired much faster, which helps all those involved. Accident reconstruction has significant consequences if the workflow is not completed properly. A small amount of error in data collection could cause massive negative consequences to all parties involved since it’s used to formulate conclusions of what occurred when and by whom. Therefore, unless you have a significant understanding of photogrammetry, RTK GPS, GIS, and crash reconstruction, most drone pilots should steer clear of this industry vertical. While drone inspections of power lines and cell phone towers happen often and can be completed visually with photography, many companies seek photogrammetric inspections for a deeper analysis. Many are not aware that tower companies must comply with wildlife and conservation laws to protect animals who have nested in these towers. Photogrammetry can provide an accurate analysis of permanent record for installation of radiometric equipment and can provide detailed positioning of particular obstacles that must be navigated with a vehicle. From roof inspections to car accidents, 3D reconstruction of homes and subjects can provide an unprecedented level of detail. With the quick and autonomous acquisition of data and processing of the aerial imagery, claims brokers can accurately measure the volume of damage from hail storms and other natural disasters. Drones are adding a level of efficiency in claims processing to help residents affected by a natural disaster get back on their feet faster. The claims are also able to get paid out faster, thus improving customer retention for the insurance agencies. While we have already discussed accident reconstruction, a simple 3D model can also help adjusters make faster data-based decisions to aid in speeding up the claims process. Mining and quarry companies will find they may be able to save more money than other industries by integrating drone mapping technology into their routine. They can audit stockpiles in record time, monitor water drainage, erosion detection, and pit management. Check out this detailed report on how drones are already being used to cut costs in the mining industry. As the popularity of solar energy continues to grow, more and more energy providers are using drones to inspect solar farms in order to spot problems early. Drone mapping pilots are using thermal cameras or infrared cameras to inspect each individual cell on the solar panels. Using a program called Raptor Maps, these inspectors garnish detailed pre-processed reports of potential problem areas. 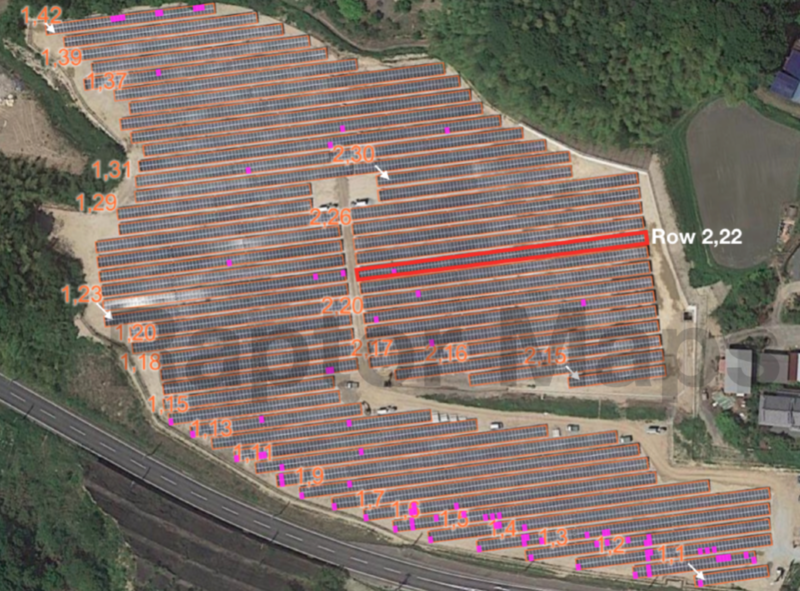 In addition, drone mapping helps ensure the plumbness of each base that holds the solar panels in place. 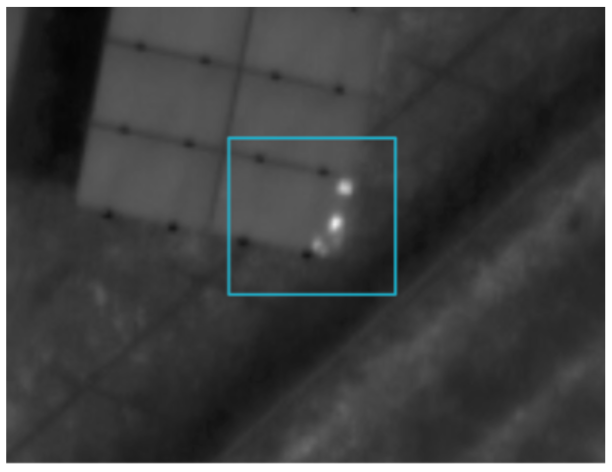 Check out this detailed case study and analysis of how Raptor Maps is aiding in autonomous inspections of solar farms. Drone mapping has already proven extremely valuable in the mitigation of wasting our natural resources. Through multiple government agencies, drone pilots are hired to take volumetric measurements of forestry overgrowth to determine how much material should be removed to restore natural plants. In the desert southwest, ranchers are paid significant money to remove juniper overgrowth to restore natural blue bonnet flowers and the water supply via the aquifer below. In addition to volumetrically calculating overgrowth, illegal logging can be detected and tracked, tree counts can be monitored, and large areas can be indexed. Learn how drone mapping saved 150,000 euros in the purchase of forestry land. While agriculture has been touted as a massive beneficiary of drone mapping, many farmers have still yet to understand the full potential of data generated from the technology. From mitigating plant disease, to indexing plants for better yield analysis, to overall plant health monitoring, drone mapping provides a powerful new eye in the sky to help solve problems, often before you would typically know there’s a problem in the first place. Using NDVI or multispectral imagery, a farmer can determine the health of his crops and have a greater understanding of where to conduct soil analysis for further analysis. Simply put, most farmers love drone mapping because instead of having to pain-stakingly walk the farm each day, they can now fly a drone and get feedback quickly, instead of waiting hours, sometimes days. Drone mapping, therefore, saves them time, increases crop yields, and ultimately improves a farmers macro “understanding” of their land. Pix4D recently released their new “fields application”, which drastically improves the time to create orthomosaics of a farm. In addition, thanks to companies like Caterpillar, the drone data can now be autonomously outputted to farming equipment so the information can be turned into immediate action (how cool is that). Hurricanes, tornadoes and floods are becoming more prominent as our earth ages. With an uptick in disaster response, drones aid in effectively responding to regions faster to help those with urgent needs. With drone data, they can efficiently distribute much needed resources in a timely manner. Can you imagine being stuck in a house with no access to your life saving medication? One day, drones will map the environment and navigate through obstacles so the medication can be rapidly delivered to the ill person. Believe it or not, this isn’t that far off into the future. Disaster management needs drones in the sky as their eyes so they can more easily and quickly know what homes are damaged and who is in the greatest need of help. With drone mapping, incident command can have a detailed map of these damaged homes and even discover the path of least resistance to reach victims. Now that you have a firm understanding of the value and benefit of drone mapping, let’s take a look at the key terms in this drone niche. As we do that, don’t get overwhelmed with all the vernacular! There are many terms here so you can get familiar with the “language.” It takes time to get these down, so bookmark this page and refer to it when needed. 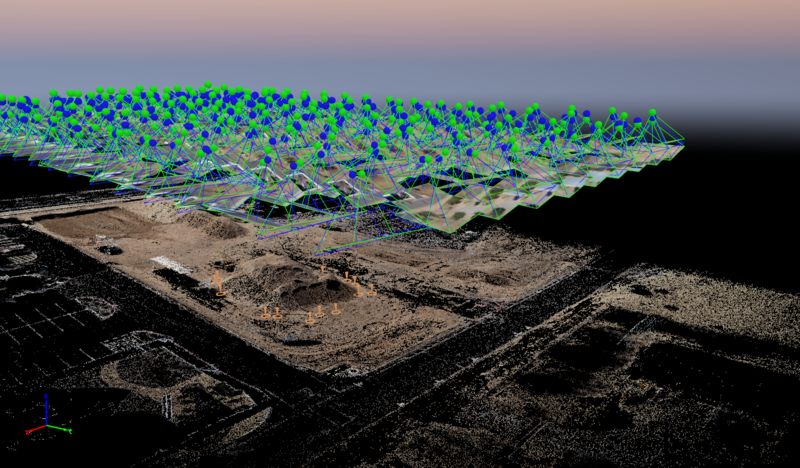 Creating 2D maps and 3D models from aerial pictures via a process called photogrammetry. It summarizes the acquisition planning discussions and identifies milestones in the acquisition process. 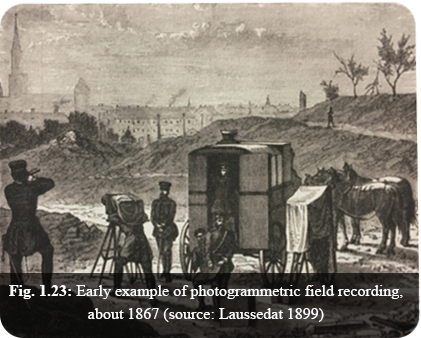 The use of photography in surveying and mapping to measure distances between objects. is a characteristic point whose coordinates are known. Their coordinates have been measured with traditional surveying methods or have been obtained by other sources (LiDAR, older maps of the area, Web Map Service). GCPs are used to georeference a project and reduce the noise (check out our GCP Landing Pads to help with this). An Automatic Tie Points is a 3D point and its corresponding 2D key points that were automatically detected in the images and used to compute its 3D position. A Manual Tie Point is a point without 3D coordinates that is marked by the user in the images. It can be used to assess and improve the reconstruction accuracy. 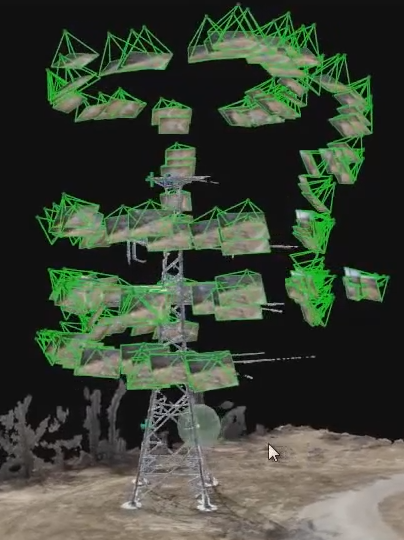 The densified point cloud is a set of 3D points that reconstruct the model. The X,Y,Z position and the color information is stored for each point of the densified point cloud. can showcase the differences between vegetation, road surface, ground surface, and man-made structures. Classified point clouds make it easy to show only specific parts of a model. The 3D textured mesh is a representation of the shape of the model that consists of vertices, edges, faces and the texture from the images that is projected on it. Different scale based on the distance that each point of the object / ground has from the camera. 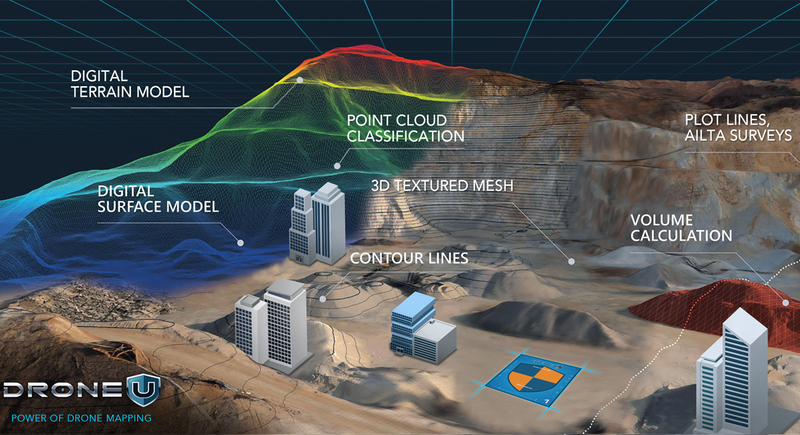 digital terrain model (DTM) is a 2.5 D model of the mapped area after filtering out the objects, like buildings. It can be exported in GeoTlFF raster file format. KML is a file format used to display geographic data in an Earth browser such as Google Earth. 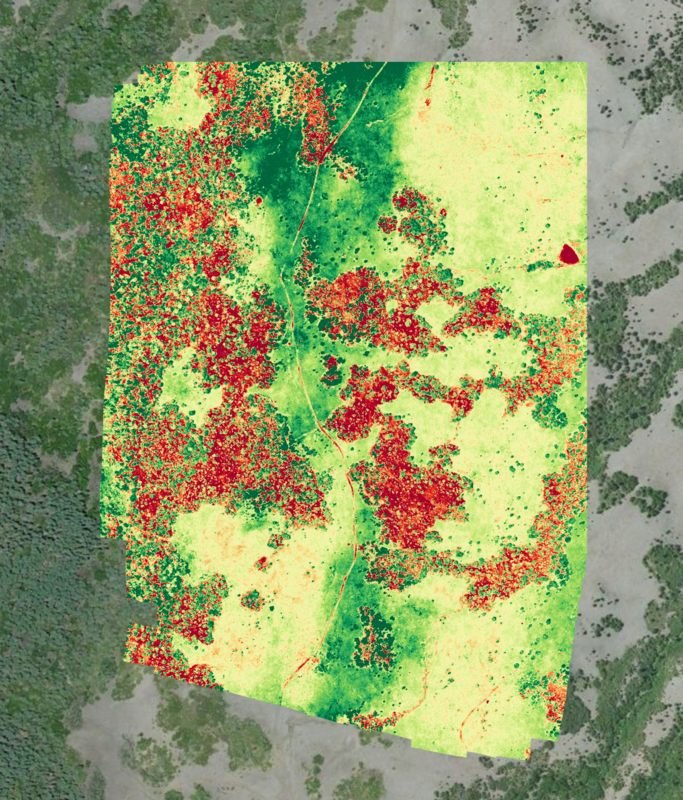 The normalized difference vegetation index (NDVI) is a simple graphical indicator that can be used to analyze remote sensing measurements, typically, but not necessarily, from a space platform, and assess whether the target being observed contains live green vegetation or not. Infrared thermography, thermal imaging, and thermal video are examples of infrared imaging science. Thermographic cameras usually detect radiation in the long-infrared range of the electromagnetic spectrum and produce images of that radiation, called thermograms. The Ground Sampling Distance (GSD) is the distance between two consecutive pixel centers measured on the ground. The bigger the value of the image GSD, the lower the spatial resolution of the image and the less visible details. The GSD is related to the flight height: the higher the altitude of the flight, the bigger the GSD value. AGSDof5cm means that one pixel in the image represents linearly 5 cmon the ground ($5 = 25 square centimeters). AGSDof10m means that one pixel in the image represents linearly 10 mon the ground (10*10 100 square meters). It is the accuracy that is defined by the difference between the location of features on a map/reconstructed model/orthomosaic and their true position on the Earth. It is the accuracy that is defined by comparing individual features on a map/reconstructed model/orthomosaic with other features on the same model. For example, two points of the model can be 2 meters away from their real position on the earth but if their relative accuracy is high, then the distance measured between these points will be very accurate as it is related with the relative position of the points. The Global Positioning System (GPS), originally Navstar is a satellite-based radionaviga- tion system owned by the United States government and operated by the United States Air Force. [21 It is a global navigation satellite system that provides geolocation and time information to a GPS receiver anywhere on or near the Earth where there is an unobstructed line of sight to four or more GPS satellites. Also know as Real Time Kinematic satellite navigation, this is a centimeter-accurate technique of obtaining GPS (or any GNSS) data. Essentially, the RTK receiver analyzes the GPS radio signal to calculate this data. Not all RTK drones actually utilize the onboard RTK data and write that on the images to create highly precise models. Currently only the Phantom 4 RTK can create drone maps without GCP's if the conditions are perfect and network access is available. It's a common misconception that all drone mapping apps complete the same job. To be clear, they do NOT. In fact, all drone mapping apps fall into one of three categories, with each app performing different functions and for different type projects. Assist in planning autonomous missions to acquire aerial imagery. 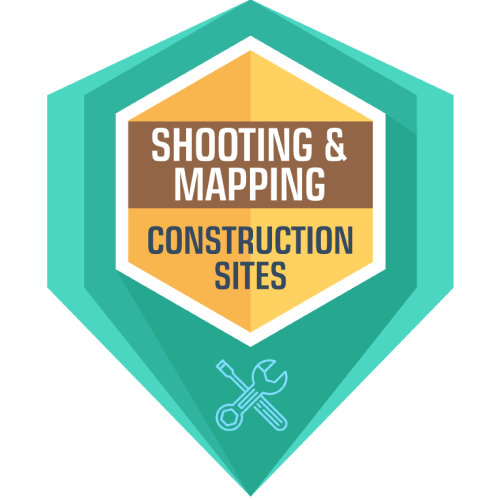 Examples in this category are Maps Made Easy, Pix4D Capture, and UCGS. Use photogrametric calculations to create point clouds, maps, orthomosaics, and other deliverables from imagery. Examples in this category are Pix4D Mapper, Photoscan Agisoft, gently, and Inpho. Can plan autonomous missions to acquire data, transmit the data to a cloud server, and then autonomously process that data in the cloud to create output deliverables. Examples in this category are Skycatch and DroneDeploy. The differences between desktop (acquisition and processing) and cloud processing (all-in-one) software are the cloud processors typically have less customization so as to ensure results containing higher accuracy and consistency. Cloud processing solutions also typically use an industry standard desktop-based app for processingdata in the cloud. It is, therefore, great for companies doing significant, large-scale mapping jobs. Let's dive deeper into some of the different drone mapping software applications available today (including some of our favorites). Please note that this list does not include every mapping software on the market, some of which weve mentioned above. Maps Made Easy is a web-based company out of San Diego that offers •pay-as-you-go” mapping solutions. Their application has become the industry standard for autonomous mission planning requiring terrain awareness, which is an important solution to have for solving the problem of acquiring data in areas with extreme elevation change. It can control DJI and other select drones. Pix4D is a Swiss company offering a suite of photogrammetric software. Their mobile app is Pix4Dcapture and will automate the mapping process with DJI, Parrot, Yuneec, and other select drones. This app has become the industry standard for capturing drone mapping data, with multiple features for orbital capture, double grid cap- ture, nadir flights, and free fly mode. The Free Flight McKie is especially valuable to drone mapping pilots who need to map complex areas. This mode will automatically calibrate overlapping images captured during manual night as the pilot controls the drone. UGCS is a Latvian company that offers an easy-to-use software to plan and fly drone survey missions, it supports almost any UAV platform, providing convenient tools for areal and linear surveys and enabling direct drone control. UGCS enables professional land survey mission planning using photogrammetry technique. Pix4Ds most well known software in their suite of photogrammetric mapping tools is Pix4Dmapper. It pr«esses any image and creates 3D point clouds and 2D maps. Known in the industry as the most powerful, capable, and customizable solution on the market, Pix4D has become the gold standard for photogrammetry processing software. It is technically the most statistically accurate as well. RealityCapture is photogrammetry software which creates 3D models out of unordered photographs or laser scans without seams. The most common fields for its current use are cultural heritage, full body scanning gaming surveying mapping, visual effects, and virtual reali- ty in general. DroneDeploy has become the industry leader for all-in-one photogrammetry solutions. With multiple purchase options, it’s able to serve a wide audience of users. The only negative aspect of using a cloud based service like this is the inability to control many settings that can increase the output quality of the deliverables. Skycatch is a San Francisco-based company founded in 2013 that primarily focuses on enterprise grade solutions for construction based applications. Skycatch has developed a new element to drone mapping by providing an on-site processing solution. 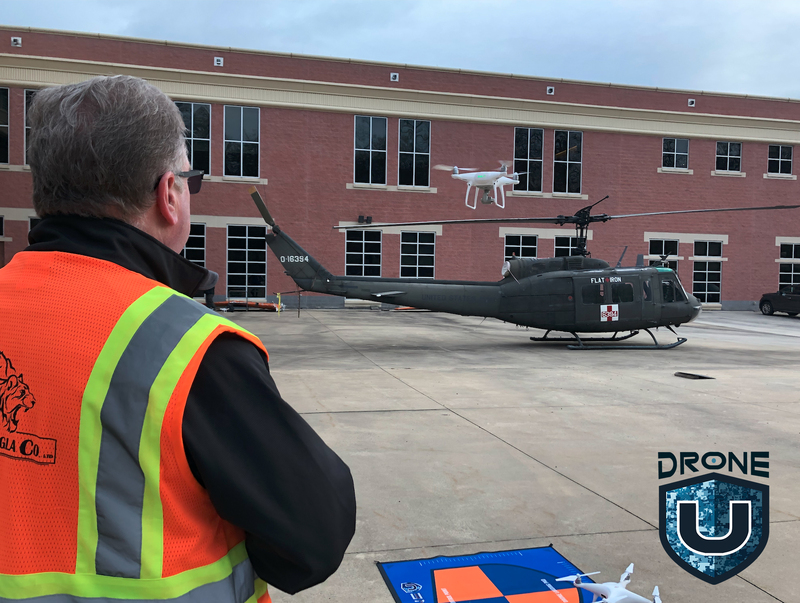 Utilizing pre-designed templates, ifs able to process data onsite via hardware that communicates with the drone, vastly increasing the speed of processing. Agisoft’s photogrammetry software, known as Metashapeor Photoscan, creates panorama stitching and supportfor fisheye lenses. Using the professional version of their software, you can make point clouds, digital elevation models, take measurements, and process RGB, NIR, thermal, and mufti-spectral imagery. 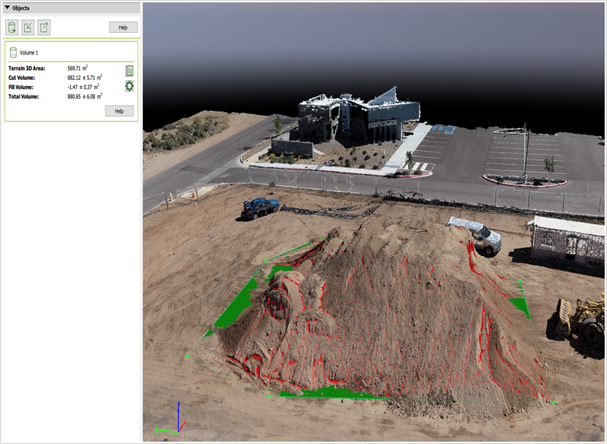 Agisoft is great for professionals who need an all in one package for photogrammetry and 3D model- ing (like architects, GIS professionals, civil engineers, and media professionals). 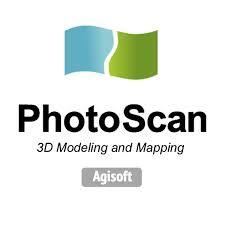 Agisoft’s photogrammetry software, known as Metashape or Photoscan. creates paruarna stitching and for fisheye lenses Using the professional version Of their software, can make clouds, digital elevation models, take measurements, and ‘YOCeSS RGB, NIR, thermal, and mufti-spectral imagery. Agisoft is great for professionals who need an all in one package for photogramrnetry and 3D model- ing (like architects, GIS professionals, civil engineers, and media professionals). The best way to learn drone mapping is from those who have already been doing it. You can glean from their experiences, both good and bad, and substantially lower your learning curve. Online – with the topdrone community in the world, can join a growing base of like-minded pilots so can continually learn from one another. You can also access all of our online drone training courses, like several mapping specific courses, so you can learn at Y)ur pace. Check out all the courses can get started with right now. 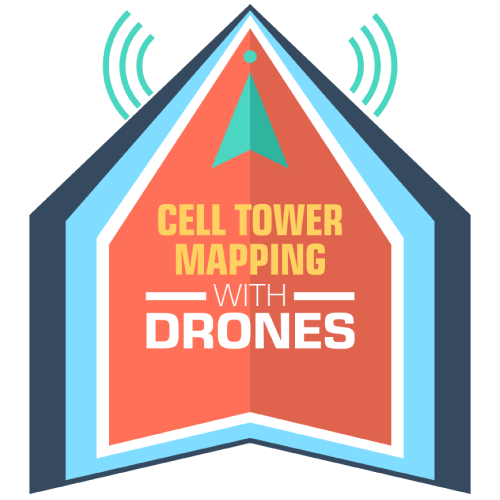 In-Person – learning live from some of the top drone mapping pilots in the country is the best way toexpedite your mappingeducation. 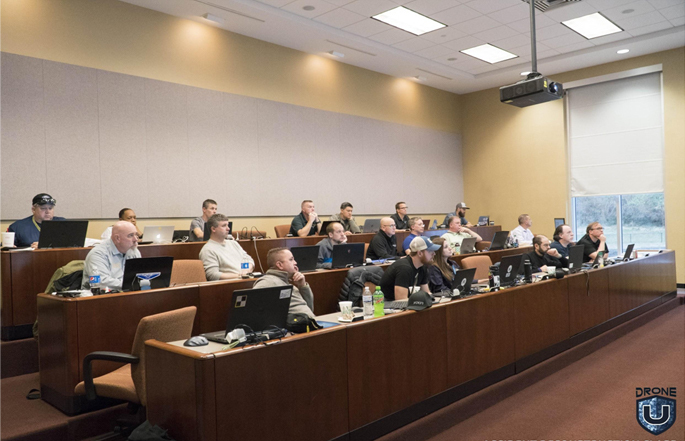 Our trainings are not only deep and thorough, they are very practical. You will learn by actually doing when take this important step with Drone U. Check out our upcoming mapping trainings and learn more about the many benefits. No matter whatyou do, get started! We are hereto help walk you through this process so you get get started or grow your drone mapping business. 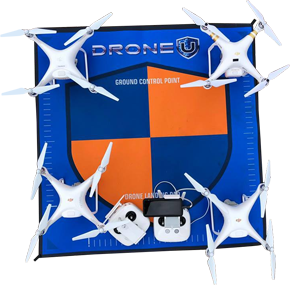 You will not find a place with better tools, experts, and community than here at Drone U. See you soon! 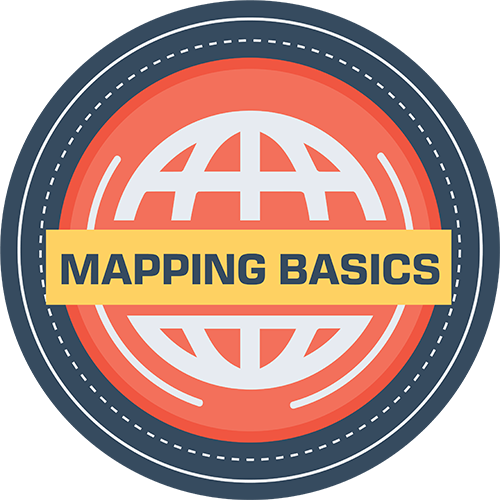 This is a high level overview of things to consider & know if you’re interested in mapping. 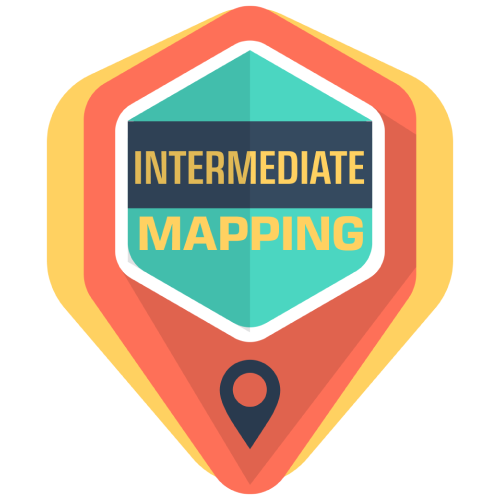 It will at least give you a “taste” of what mapping is like and can do in this fast-evolving niche. Learn from our Chief Pilot, Paul Aitken, & FAA Certified Flight Instructor, Ted Wilson all you must know, should know & DON'T need to know to pass your test.